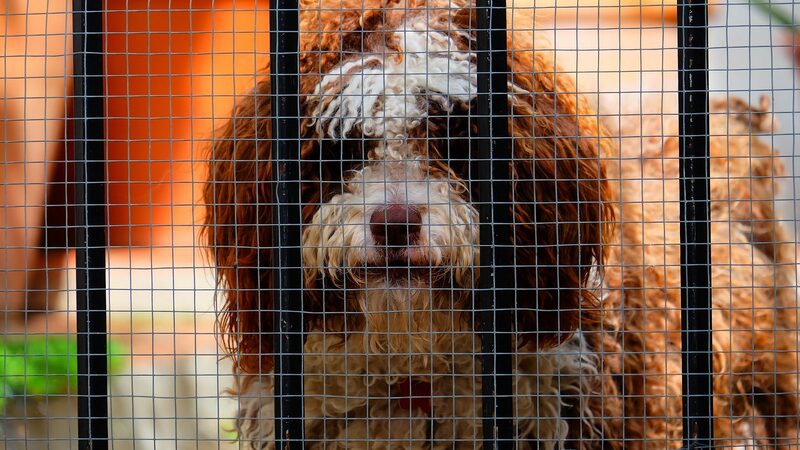 Puppy Mills – How much do you know about them? I had never heard of a puppy mill until December of 2010, when we adopted a dog from a local animal shelter. Just a few days before Christmas 2010, we went to look at dogs at the Denver Dumb Friends League. I was just browsing to see what kind of dogs were there. I had the idea that our family dog Missy was going to die soon, and that Brianna would not handle that well at all. So, I wanted to get another dog for her to bond with before Missy died. We walked the area and looked at so many dogs in enclosed glass kennels. There must have been a dog of almost every breed! Brianna wanted a “pocket” dog, one she could carry around, dress up, and treat like a baby. While walking through, we noticed the tiniest dog we had ever seen. The name on her information sheet was Polly. Polly is a 3 lb. 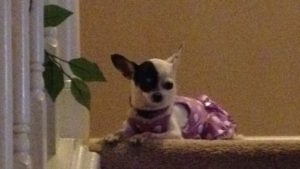 pure breed chihuahua. She is all white with a black patch around her eye. We asked if we could see her but she was on hold for people who were on a list, wanting chihuahuas. We pleaded with the volunteer of the shelter to let us play with her anyway. Within a few minutes, we were taken into a room, and she was brought to us. Brianna instantly fell in love. We were told that she came from a puppy mill that was raided in Missouri. They rescued 93 dogs from that horrible place. We acknowledged all of the challenges we would face in raising her, and were granted the opportunity to adopt her. We took her home and her issues were very apparent. This was the day I was introduced to what a puppy mill is and then I educated myself more after returning home. A puppy mill is a place where dogs are kept for the sole purpose of breeding, over and over again for profit, until they die. The dogs are kept in filthy cages, stacked high and wide. The poor dogs never get let out of the cages, have no human interaction, toys, or any type of comfort. They get little to no food or water. These dogs have many illnesses that are left untreated. Puppy mill dogs have behavioral and/or health issues. They are nearly impossible to train because of the environment they have lived in. They are extremely fearful dogs and don’t understand why a human would want to hold them or interact with them. Many, many pet stores in your local mall buy puppies from these nasty places, and tell you they are from a reputable breeder. The average person has no idea otherwise. If people would stop buying puppies from pet stores, the mills would eventually shut down. So many people want a puppy, then don’t like how they look or act when they grow up, so they are given away to a shelter. Buying or adopting a pet is a huge responsibility. Please consider all factors before making this addition to your family. There are thousands of unwanted pets all over the country. It has been a little over a year now since we adopted Polly, who Brianna renamed Roxy. She is a very loved member of our family. She is still not house trained, and still has behavioral issues but we are not giving up on her. PLEASE EDUCATE YOURSELF TODAY AND DO YOUR RESEARCH BEFORE BUYING A PUPPY. HELP SAVE LIVES! To watch a video to learn more, please click below.